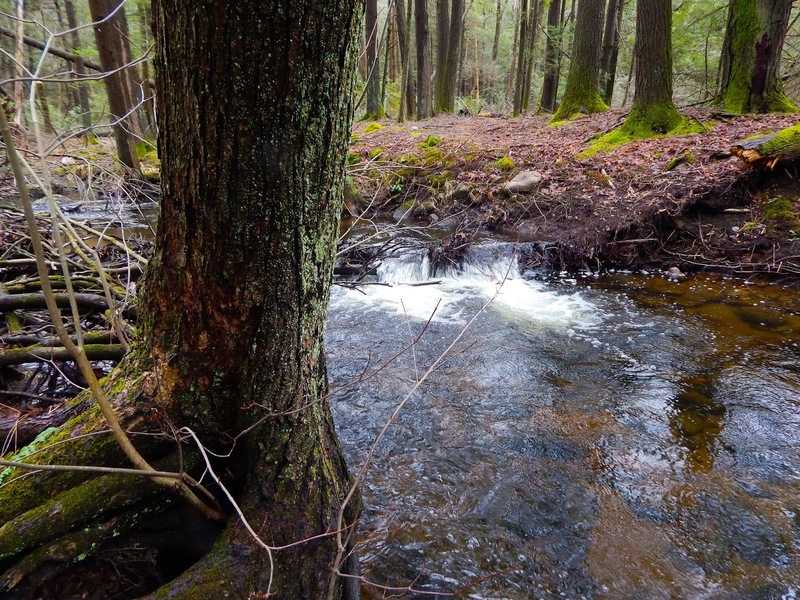 Small Stream Reflections: Changes, Some Good And Some Good. Changes, Some Good And Some Good. This is a stream I visited last month. It was a time when we were in a spring like thaw and it was so welcomed after the deep freeze we had in late December and much of January. The stream I am very familiar with having enjoyed it for many years. 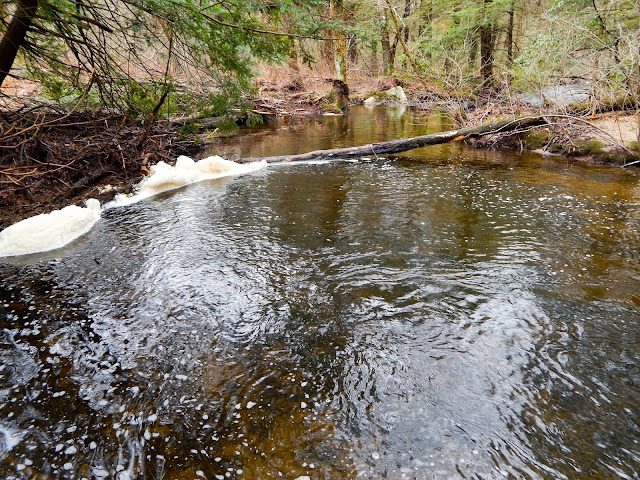 It also suffered like most streams with drought like conditions for a few summers. Last year it fished some what on the off side which was to be expected. As of the new year I tried this stream in January, big mistake. The stream was ice bound, I could only drop a fly in the water in only a few places. It was cold that day and I should have stayed home an enjoyed my coffee and read a book. On this day I had no idea what to expect as far as catching a fish. The first few pools I fished gave up nothing. It was not until I came upon this one that my day really brightened. The second or third drift that I saw the line stop, tension and suddenly I felt the fish. Soon at hand was this stunning brook trout. A side note, that pool was where I caught my first fish of the year several years ago on a cold windy New Year's Day. This pool with it's mound of wood at it's back is a place that should hold a fish. That statement is true but for some else and not for me. Over the years I have lost a lot of flies in here but have not taken a fish....until this day. I drifted my fly towards the back near the wood pile on the left. I felt the hit, it was a substantial hit. I set the hook and the fight was on. I won't go into the details of it but I will show you the result below. This wild creature is big for this stream. He was very strong and may have been living here for some time. I was thrilled and fortunate he liked my offering. 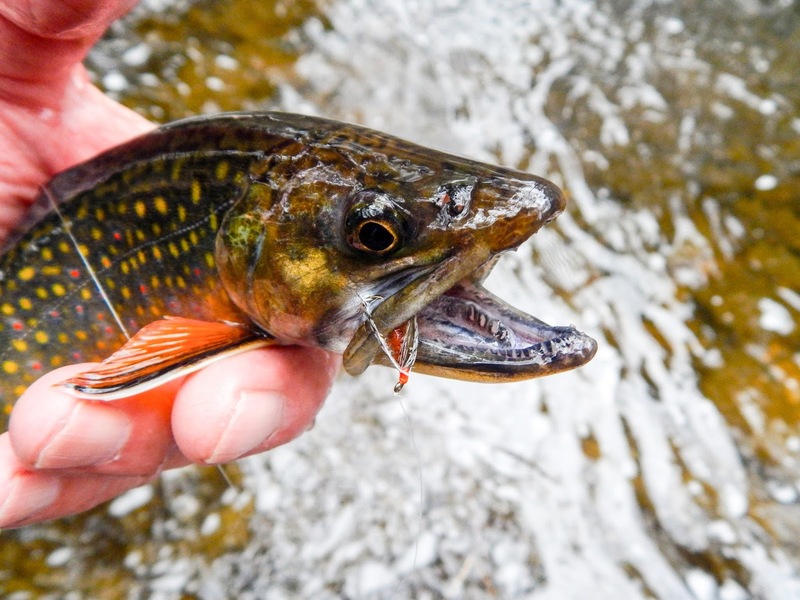 With a mouth like that I give fair warning to any small brookies "stay away". 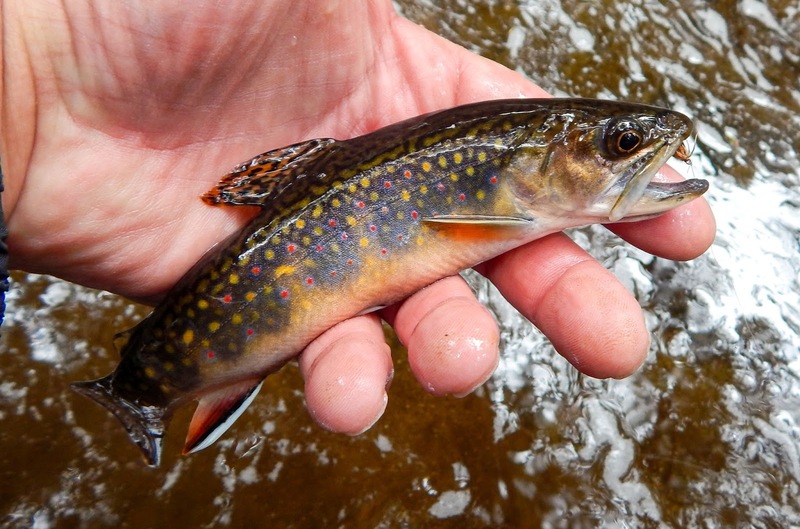 This stream yielded several more brookies. I fished it upstream and found some profound changes from the heavy ice. Come May I'll get the real picture. Spectacular pics, Alan; thanks! That big brookie is impressive. I'm sitting here with that cup of coffee you mentioned, looking out my window at 8 feet of snow and enjoying your post! C'mon, spring! My goodness Mike 8ft...better stock up on the coffee, more snow coming. That is some Brook for such a small stream. I'm sure you two will meet another day. Mark there is a section upstream we named the "black hole" deep and dark. Several years ago we saw a couple of 14 inch fish in there, never hooked them though. Bill it raised hell with the little 3wt. I'll get back there come April. John back in February we had some beautiful weather, but since March we have had 2 big snow storms with another one on tap for tomorrow. Beautiful photos of the stream. Appears it is running full. That large brookie is just outstanding. I am sure you enjoyed that outing. Pete the stream was max to the banks. That brookie made my day and month. One of my better day this year. I heard that said before, and I totally agree. Alan - Nice to see that stream healthy again. I remember that NYD, the wind made it brutal! 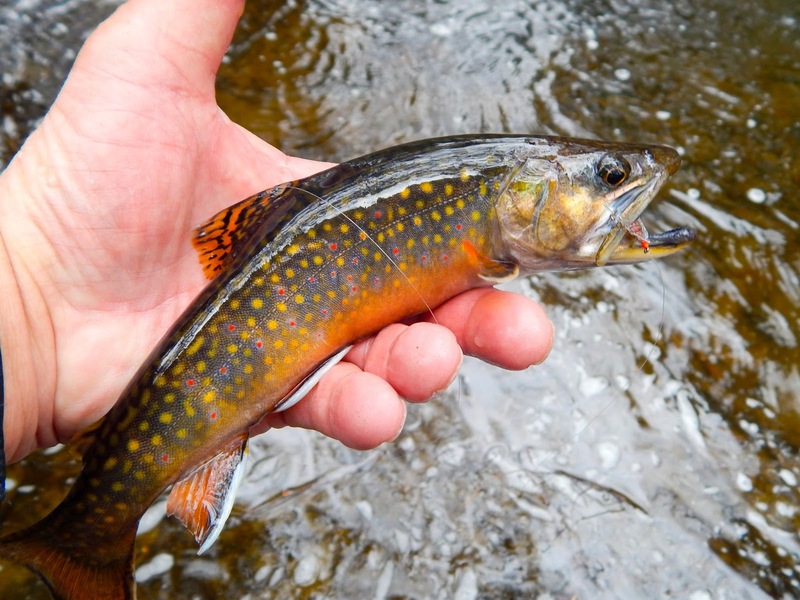 and that is one fine looking brook trout for a small stream! Mark so far it seems to have recovered well. That NYD was one for the books, although this year was an epic one. Very nice fish! Amazing colors that only nature can make happen. Ralph one of natures finest. Dang, what a big brook trout for that small stream, Alan! Such beautiful colors to boot. I agree, that trout has been living there for a good while. How many years would you guess...a 5 year old? 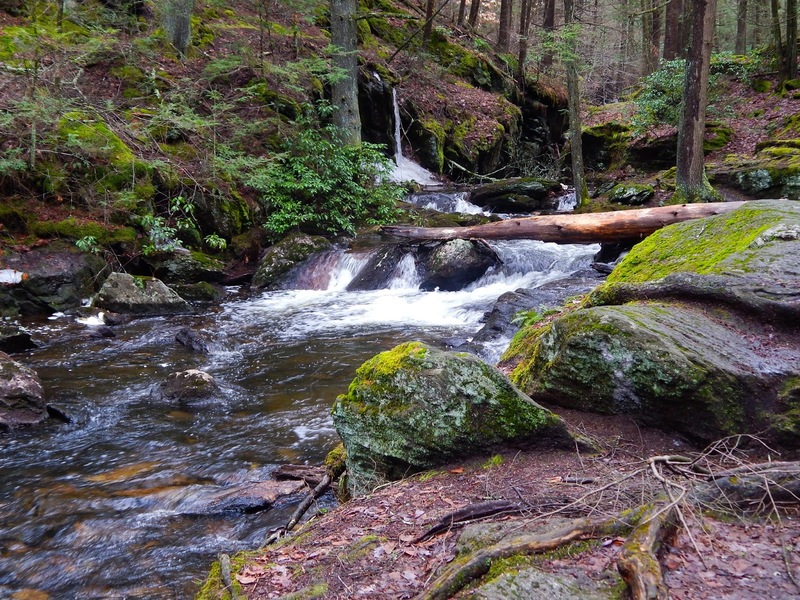 That stream is flowing well as are all around these parts. I hope that trend continues as I do not want a repeat of 2015-16. Sam I estimate that guy is at least 4 years old. He beat those drought years of 15 and 16. I hope I run into him this fall. Streams all over the east are in great shape, fingers crossed they remain as they are now. Alan, that a real crocodile for that stream. Isn't it interesting how a stream will change from one month to another. Beautiful looking water. What was the magical fly ? Thankyou for the journey. Brad that guy had some mouth. Winter can do some rearranging for sure. Most times it makes for better conditions and it's almost like fishing a new stream. The fly will be featured in an upcoming post. The post above is simply awesome! The stream and the surrounding woodlands are beautiful together making this a place all of us want to be especially when there are brookies such as these within her borders! There is an intimacy in small streams that is lost in larger waters! A great post indeed and I am glad to see, even though nor'easter #3 is heading your way soon, that winter is finally backing off a bit! 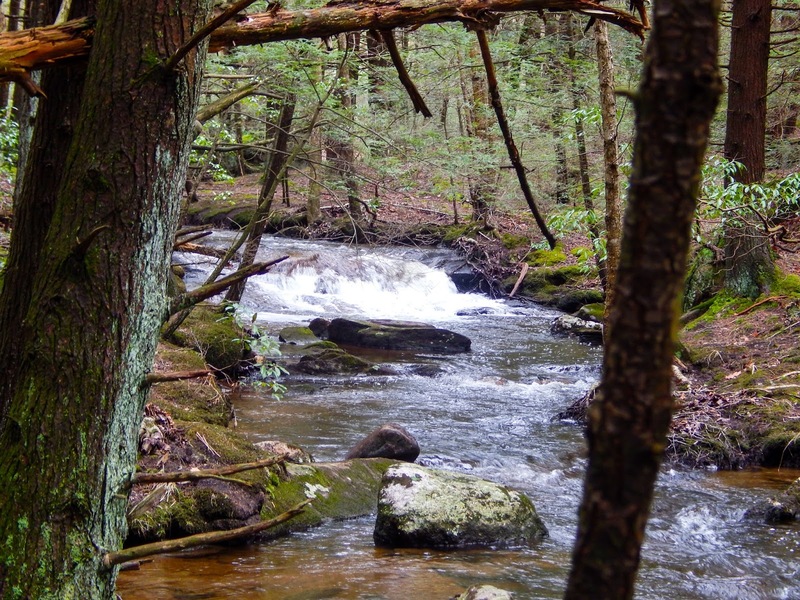 Keep posting these gorgeous places and wonderful brook trout! I can't get enough of it! Doug I assure you that stream has been totally transformed into a winter wonderland. The 3rd storm in about 10 days. I'm a native New Englander and right about now I say enough. Have a coffee in the den and enjoy SSR's. Alan - Just back from a long power outage and the look of those brookies just picked my spirits up some. Thanks for posting. Pat I'm happy to hear that power is back on. They say parts of your state received over 2 feet of heavy snow. A couple of months and it will be but a not so good memory. Great looking fish Brk Trt..your patience paid off..they are undoubtedly perfect predators..
Mike patience is the key. I have much more of it these days. Wow, that's some male brook trout right there.... Looks like a nice day out, thanks for the report. Doug he was a big fellow for that stream, a ruler for some time. That guy made my day, then again just being there accomplished the same.